I started back on Miconazole Nitrate a few days ago. I have used it before and out of all the topical growth aids I have tried this has given me the least amount of side effects. Actually none that I can think of off hand. I plan on applying it to my scalp daily for a month. Then, taking a break and starting back up for another month. That way my body will not get so used to it and I can continue to see growth without reaching that plateau. When I did use MN previously my hair grew an inch for that month. The tube I got lasted me exactly one month. I dont really have a valid reason for not continuing to use MN other than the fact that I did not want to be seen buying Monistat or atheltes foot cream every month... People will think theres something seriously wrong with me... LMAO! This time I was browsing around on ebay and I was curious to see if anyone was selling for less than what they cost in the store. Luckily I found quite a few of them, so I got a BIN for $10 for 4 tubes. Good deal! Usually I would end up paying $10 for one tube. I am actually dying to measure my hair, but want to wait until Aug because thats my scheduled check in month. If I do measure, I will post on the blog so that I can do a comparison next month to see how much growth from the MN I'm getting. I'm actually a little afraid of what the tape measure will say. I'm sure my last 2 measurements were a little off because I used a ruler instead of tape measure, and also because I had a little breakage from overusing the BKT and not deep conditioning often enough. I am however back on track. My breakage is under control. I will not say that it is gone yet completely, but its getting there. Also, I am deep conditioning 2x each week like I should be. Yay! I can tell a great difference in my hair. 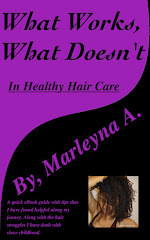 It feels much softer, it is laying down smoother, and the curls are more defined. It's awesome! 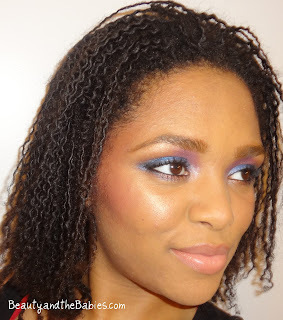 For me, deep conditioning twice weekly is an absolute MUST! I know for a fact that if I do not do this my hair will break regularly. When I do this and once I have the protein and moisture balanced, that is when I reach that point where I get NO BREAKAGE! 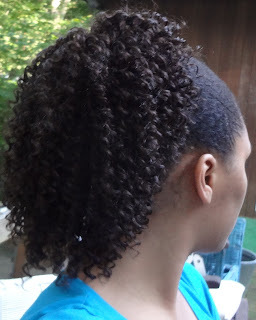 I am still protective styling with the ponytail baggy, pictured here. Took this pic today. I really love the curls on this one. I am actually hoping to be at the bottom of my brastrap when I measure next month.